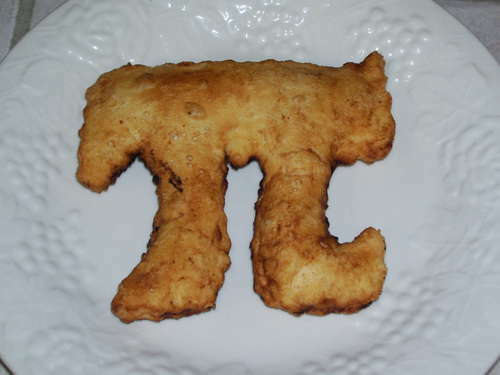 March 14 is Pi day! That is, 3/14, and the NES lesson, Calculator Controlled Robots, has a mission devoted to circles and Pi. In mission 4, students create three different size circles using three different robot wheel movements. They can attach a marker at different positions as well as use different turn commands to create larger or smaller circles. For each circle, students measure the diameter with a length of string and determine how many string-lengths it takes to go around the outside of the circle. This helps them discover that the distance around each circle, no matter what size is a little more than three lengths of string, or the diameter, for each circle of different diameter. The discovery of Pi leads to the circumference formula as well as the area formula. You can find the Calculator Controlled Robots lesson after logging in to the NES Virtual Campus. As part of a series of electronic professional development experiences, the NASA Explorer Schools project and the National Science Teachers Association are hosting a 90-minute Web seminar on March 13, 2013, at 7:30 p.m. EDT. Discover a unique way of integrating robotic technology into your algebra classes. Robotic missions engage students and provide a unique way of bringing to life the concepts you are teaching. Learn to use programmable Texas Instruments, or TI, calculators and Norland Research Robots to solve problems requiring substituting values for variables in formulas. This is the last time this seminar will be offered during the current school year. As part of a series of electronic professional development experiences, the NASA Explorer Schools project and the National Science Teachers Association are hosting a 90-minute Web seminar on Nov. 7, 2012, at 6:30 p.m. EST. Discover a unique way of integrating robotic technology into your algebra classes. Robotic missions engage students and provide a unique way of bringing to life the concepts you are teaching. Learn to use programmable Texas Instruments, or TI, calculators and Norland Research Robots to solve problems requiring substituting values for variables in formulas. For more information, visit the online registration page. On April 16, from 1-2:30 p.m. EDT, your students have an opportunity to interact with NASA experts who will be on hand at the Space Shuttle Landing Facility at NASA’s Kennedy Space Center in Florida to celebrate the Space Shuttle Discovery Fly Out. NASA Explorer Schools recognizes teachers, schools and students who become highly engaged with all the NES project has to offer. Highly engaged participants have the opportunity to apply for unique, expenses-paid recognition opportunities for teachers, students and schools. Attend this session on Apr. 17, from 4-5 p.m. EDT and learn how your can participate in these exciting recognition opportunities. Click on the title of this section to register. As part of a series of electronic professional development experiences, the NASA Explorer Schools project and the National Science Teachers Association are hosting a 90-minute Web seminar on Apr. 18, 2012, at 8:15 p.m. EDT. Discover a unique way of integrating robotic technology into your algebra classes. Robotic missions engage students and provide a unique way of bringing to life the concepts you are teaching. Learn to use programmable Texas Instruments, or TI, calculators and Norland Research Robots to solve problems requiring substituting values for variables in formulas. For more information and to register online, click on the title of this section.